The DHC-7 / DASH-7 was originally conceived as a mid-sized commercial regional airliner, operating on intercity routes between major metropolitan areas from small local airports. This requirement dictated a design that had good short-field capability and a low noise signature. Construction of prototypes began in late 1972, with the first of two prototypes taking to the air on 27 March 1975 with DHC chief test pilot Robert H. Fowler at the controls. The type received Canadian certification in the spring of 1977, with the first production aircraft flying shortly afterwards. The first customer delivery was in early 1978. The DASH-7 featured a cylindrical fuselage, high wing with a prominent dihedral, tee tail, and four Pratt & Whitney Canada (PWC) PT6A-50 turboprops, each rated at 835 kW (1,240 SHP) at takeoff and driving a four-blade, fully reversible Hamilton Standard propeller. The propellers were wide, with a diameter of 3.4 meters (over 11 feet), to allow them to provide adequate thrust at relatively low RPM, reducing noise. The aircraft featured an aerodynamic lift enhancement system with double slotted flaps over 80% of the wingspan, along with an outboard spoiler on each wing to provide additional control as needed. With these features, the DASH-7 could take off and land in less than 700 meters (2,300 feet) — in fact, it is said it could take off at a rate that would leave most passengers thinking they’d left their stomachs back on the runway. In contrast to the DASH-7, a Boeing 737-300, which had a degree of short-field capability in the form of thrust reversers and triple slotted flaps, required about 1,400 meters (4,600 feet) for takeoff and landing. The DASH-7 had tricycle landing gear, all assemblies with single wheels, the main gear retracting forward into the inboard engine nacelles and the nose gear retracting backward. The DASH-7 featured pneumatic de-icing boots on wings and tailplane; presumably the windshield and engine intakes were electrically de-iced. Avionics kit was conventional, with a weather radar in the nose as standard. The initial DASH-7 model was the “Series 100”, with seating for 50 passengers in four-across seating, along with pilot, copilot, and one or two flight attendants. Passengers got in and out through an “airstair” door on the left rear, with an emergency exit opposite, and an emergency exit on each side behind the cockpit. The aircraft featured a toilet and galley, plus a baggage compartment in the rear, with the compartment door to the rear of the passenger door on the left side of the fuselage. One LD-3 container and 34 passengers. Two LD-3 containers and 26 passengers. Three LD-3 containers and 18 passengers. Executive transport configurations were considered, but nobody ever obtained one. The Dash 7’s first flight on March 27th, 1975. This unique design featured 4 x PT6A-50 engines, wing span of 93 ft., MTOW of 44,000 lbs. and original list price of $1.7M! A total of 113 Dash 7 aircraft were delivered before production ended in 1988. A “DHC-7-110/111” was offered to meet UK Civil Aviation Authority (CAA) requirements, plus a “DHC-7-150/151” with more fuel, higher takeoff weight, and improved passenger accommodations. Other variants were considered but never built. While the DASH-7 was an attractive and well-built aircraft, the urban STOL market that DHC had anticipated never materialized — to the extent there was a market for a STOL airliner, the Twin Otter could do the job — and the DASH-7 didn’t sell. 108 DASH-7s had been sold by 1987. It is now out of production, though Viking Air has obtained rights to the design. Such DASH-7s as were sold were put to good use. 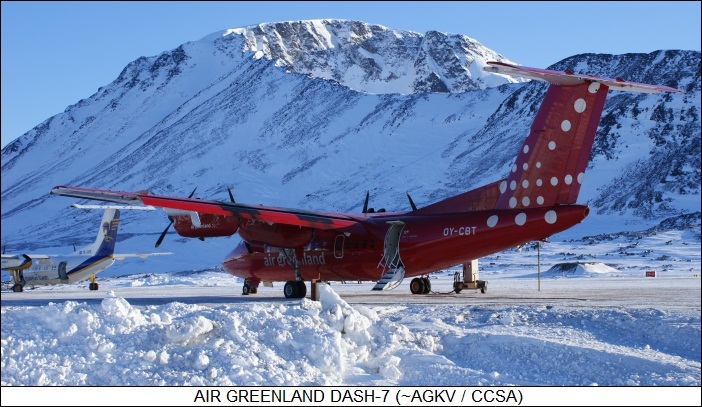 One well-known commercial operator was Air Greenland, with its handful of DASH-7s proving useful in handling the small airfields and rough climate conditions found in the region. The United Nations has also made use of DASH-7s, finding them handy for their ability to operate out of small airfields near disaster zones — with these machines chartered from commercial firms. A few DASH-7s were obtained by military and government organizations. Two were used by the Canadian Armed Forces under the designation of “CC-132”; they were more or less conventional passenger-cargo machines. 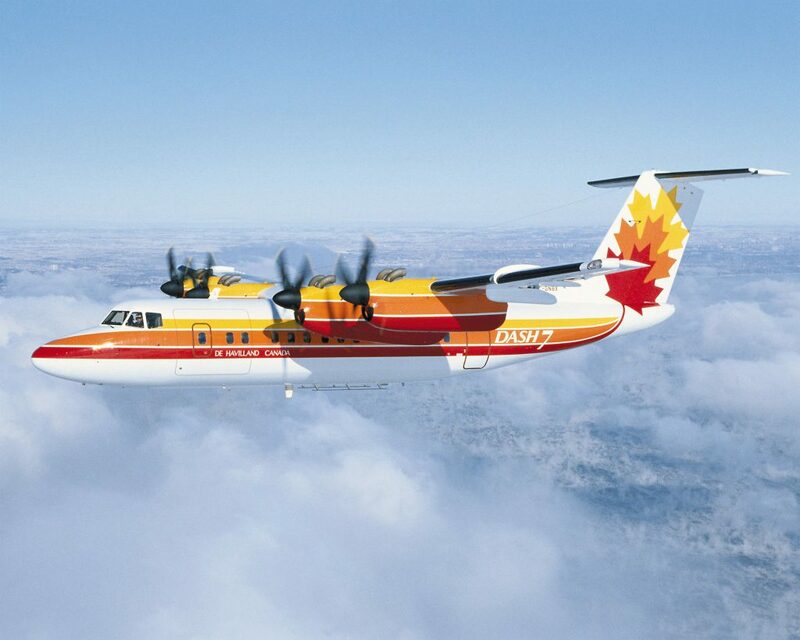 One DASH-7-150 was put into service as the “DASH-7R” or “DASH-7IR” with Transport Canada for the “National Aerial Surveillance Program (NASP)”, performing patrol flights over the oceans or the Great Lakes to perform pollution surveys, ice patrols, and general maritime surveillance. This machine was eventually fitted with a second “cockpit” for observers, perched on top of the forward fuselage; as well as a side-looking airborne radar (SLAR), with the radar antenna in a fairing along the lower left side of the fuselage. It could also drop flares and rescue gear.